Is the illusion of a magical holiday season becoming a thing of the past? Have we now entered a phase of our psychological development where we are able to see past the false reality of perfectly styled commercials with the intentional mix of hipsters, millennials, intellectuals, and race to make us feel a certain way? The holidays are supposed to be a time of cheer, but often times bring up painful emotions, especially if we spend it with family. The lights, music, and overall sense of wonder try to trick us into believing anything is possible and that all of our old wounding, disappointments, and stories will suddenly disappear but the reality is often times much different. I’ll never forget the year it became crystal clear that my fantasy of being seen and valued by my sister was just wishful thinking. It was 2008. I drove from Los Angeles to Seattle for the holiday with my son, Cole, who was 5 at the time. In Oregon, a horrible snow storm hit, which I had tried to miss by leaving a couple days early, to no avail. The customary, two-day trip took four. Every time I had to ask a stranger for help with my snow chains, buried feelings of single motherhood loneliness along with helplessness rose to the surface. The cheap, roadside motels with burn holes in the carpets had me feeling like an inadequate loser. While crawling down the freeway, entranced by the snow falling on my windshield and the repetitive thump of the broken snow chain hitting my wheel well, I entered my own snow globe fantasy of my sister opening her front door with outstretched arms, a gush of warmth heating my cheeks, the smell of cinnamon and vanilla filling my nose, a glass of my favorite wine waiting for me, followed by long conversations about our lives. However, once we arrived, my sister gave me the usual obligatory hug and went about her business as if I wasn’t there, talking to her kids, my mom, laundry, etc. The snow globe fantasy shattered and I was back in reality sitting with Cole wondering why we’d come, feeling hurt, yet again. So how do we escape the trap of expectations during the holidays? 1. Let’s start with the most obvious – let go of expectations. Expectations can be very subtle, so become mindful of the smallest of them. If you become upset, notice if it’s from an unmet expectation. Then ask yourself, did you communicate your needs or are you assuming everyone can read your mind? 2. Practice setting intentions for your own behavior. This could be as simple as deciding to be the one to create the experience you wish to have. I could have sat my sister down for that long conversation I desired, but instead, I expected her to read my mind. 3. Don’t take things personally. Remember, everyone has their own internal worlds and their behavior might not have anything to do with you. If someone is acting upset, get curious and ask how they are doing. 4. Even if you’ve had a year of growth and transformation and are super excited about it, that doesn’t mean it’s your job to fix everyone. Let others be who they are. You are responsible for you. Feel free to celebrate your growth but remember everyone’s on their own path. 5. If family dynamics have changed because of divorce, new babies, engagements, etc., welcome the change. Things don’t stay the same, so embrace what is happening in the moment. 6. Set healthy boundaries and allow others to have their own response to them without feeling responsible. This can be tricky, so be sure to prep with your therapist or coach before the holidays. 7. If you are a perfectionist, make this the year you learn to let go. Laugh at your perfectionism and don’t take yourself too seriously. Maybe notice how your perfectionism affects other people. 8. Instead of focusing on gifts, focus on experience and time. 9. Notice if you are buying a gift out of guilt or from love. Only buy gifts from love. 10. You always have a choice how you want to spend your time. If your family is too toxic, instead, choose to spend time with people who love and support you. Do not tolerate abuse. 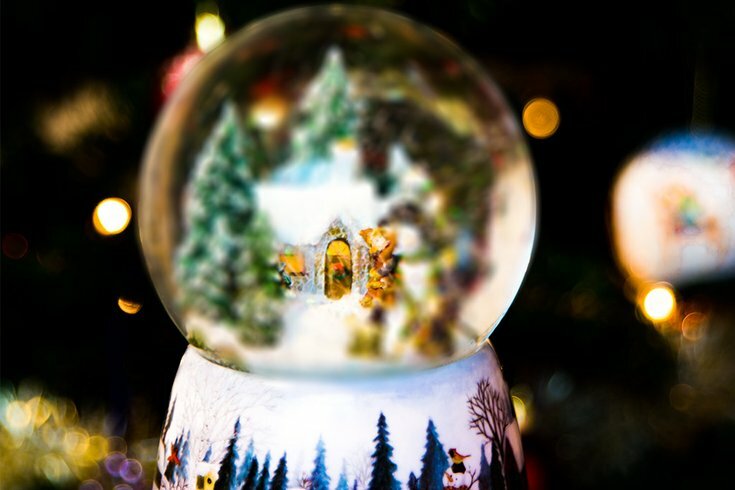 My snow globe fantasy mixed with feelings of insecurity created outlandish expectations, which, in turn, became the perfect gift. After that Christmas, I never again needed or expected my sister to show up differently. I realized, I hold a place, somehow by me being there, the holiday feels more complete, whether she talks to me or not. It is always my choice, if that’s how I choose to spend my time and energy. Perhaps this holiday season you can give yourself the greatest gift of all – truth. Reality is reality. It is the gap between our expectations and how things really are that create suffering. Live in truth and you will find freedom. It doesn’t get better than that.